The first trade paperback of DC Super Hero Girls has sold over 100,000 copies, and the huge success of this property has convinced DC Comics that it should have a strong line-up of comics geared toward younger readers. Last week, the publisher announced two new graphic novel imprints: DC Zoom for middle grade readers and DC Ink for young adults readers. These books will be written by authors who already have established fan bases in these target demographics, some with comic-book experience—including Gene Luen Yang on the boldly titled Superman Smashes The Klan—but many making their comic debuts after building a name for themselves in prose novels. These two imprints are very smart moves that significantly increase the number of female creators at DC, and the show that the publisher is paying attention to the popular trends in comic books and trying to find ways to appeal to the steadily growing numbers of young readers hungry for graphic novels. DC Ink begins with Harley Quinn: Breaking Glass by writer Mariko Tamaki and artist Steve Pugh and a new Mera title by writer Danielle Page, and DC Zoom debuts with more DC Super Hero Girls, sending the teenage heroines on a search for Atlantis. These two imprints won’t debut until fall of this year, but DC Super Hero Girls isn’t stopping to wait for its new home to be ready. 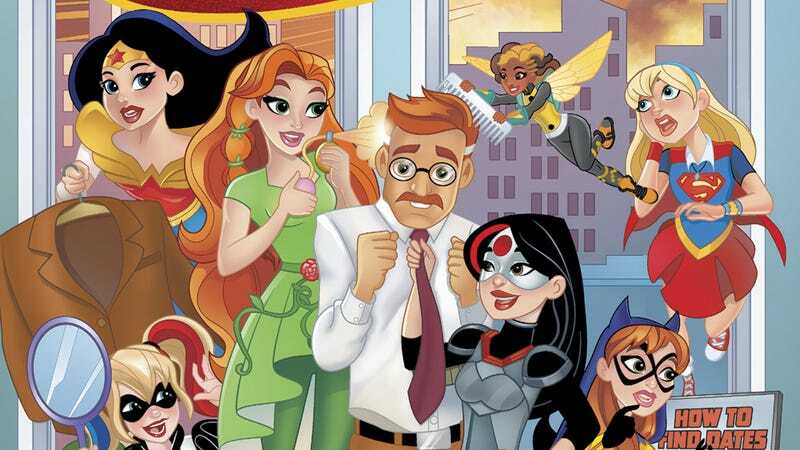 Just in time for Valentine’s Day, the latest installment of the series has the heroes playing matchmakers for both the student body at Super Hero High and one of their parents: Batgirl’s dad, Commissioner Jim Gordon. This exclusive excerpt from DC Superhero Girls: Date With Disaster, on sale now, spotlights how writer Shea Fontana, artist Yancey Labat, and colorist Monica Kubina bring these heroes down to Earth, and while there’s plenty of superhero drama in this series, what really makes it engaging is the interaction between the characters. The writing and art have a light touch that makes the story perfect for younger readers, and they can join these heroes on their romantic adventures by picking up the latest volume of this series.